Out in front of all the rest. out there somewhere in the west. Fast as lighting on the plains. But they gotta go some more. Cowgirls are special when they follow their dreams. Every race is a brand new start. Some are running for the sake of running. Some are running from a broken heart. Told me just how much she loved the rodeos. She said, the boise show. She took a third in Butte just yesterday. Don't leave time for standing still. And the nights they never end. And it's the only life she knows. And at times she misses the the kids she never had. And she's learned to take the sad. And she had that look of leavin' in her eyes. You just can't tell a life long dream goodbye. three turnsand a gallop is rather tame. makes some circles and out the gate. on a good horse, not a snide. because you are in for quite a trip. you'll be happy he's still on his feet. that jerk you felt was him shifting gear. he's bearing down on the second can. if you ride him through this second turn. when he leaves there set him free. 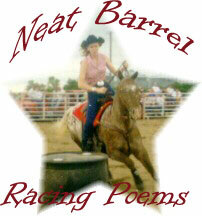 I'm a Barrel Racer, Lord. A quick time is what I need. With a descent amount of speed. To run this horse of mine. And then the next one down the line. Just as soon as I dust off. Ever anxious for my next ride. To win or lose with grace. This very same barrel race. My barrel horse and me. I believe this is the key. To you and to my horse. And we quickly race for horme. We will compete in our next race.